Yuuby | Francis Andre's Note "Al Lamb's Dallas Hon..."
848 EVO: Excitement EVO. The 140 hp of the Testastretta Evoluzione engine and the awesome braking power of Brembo monobloc calipers take the performance level of the 848 EVO – Ducati’s lightest ever Superbike – to the extreme. Joining the Ducati Superbike world has never been so thrilling. 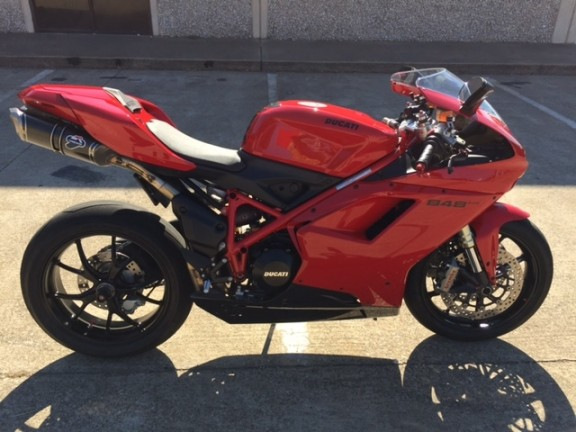 This 2013 Ducati 848 Evo is beautiful, Red with Termignoni exhaust, shorty levers, red Ducati bar ends, super low miles……. a must see!!! !